The MDware toolkit is available in English, French and Dutch and is compatible with Belgium and the Netherlands in terms of tax regulations. Other countries can easily be added on request. 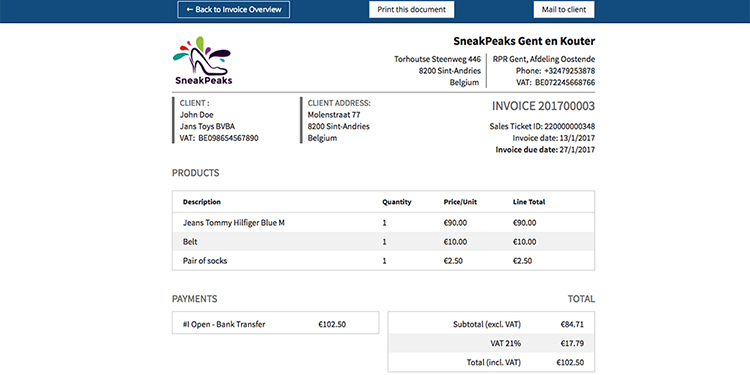 Functionality • Create invoices and credit notes during or after a sale • Choose between paid and due invoices • Tweak the invoice to your needs • Print or mail the invoice to the custumer • Print packing slips • Mark due invoices as paid • Multi-shop support UPCOMING • We are constantly improving our tool and will be adding integrated online payments, reporting and more soon. We are always open to feedback and feature requests. About us MDware has been a close partner to Lightspeed for years. As operational partner we implemented the different Lightspeed solutions at several clients and got to know shortcomings MDware could solve. MDware is daily working together with Lightspeed and ensures great quality and support. More information Feel free to contact us or ask your local Lightspeed Sales team for more info!